Are your teeth a bit vain and do they really care about their appearance? If they do then they are gone like you to wear this t-shirt. 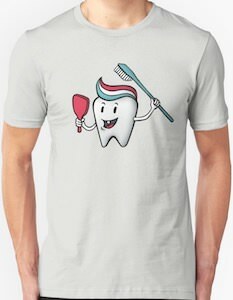 On the t-shirt, you can see a tooth holding up a mirror and applying toothpaste to the top with a blue toothbrush. The toothpaste is positioned just perfectly so that it looks like the tooth is wearing a hairpiece made out of 3 colors (red, white, and blue). If you would like to wear a t-shirt with a tooth on it then this shirt is just perfect and it would be fun to wear to your next dentist’s visit. You can get this t-shirt in many colors and styles for both men and women that would like to wear a funny tooth shirt like this.